Why Book Indonesia Tours with Us? An overwhelming travel destination, Indonesia can give you memories that are unforgettable, and so do we at Tour My India with our selective Indonesia tour packages. Yes, Indonesia is one of our favourite tourism destinations as well and this why we take special care to design our travel itineraries so that none of the experience of this culturally, historically and naturally opulent destination is missed. Our Indonesia tour from India ensures that you get to enjoy a glimpse of everything that this Southeast Asian destination has on offer. Since Indonesia has a romantic destination repertoire, especially Bali, the country has become a popular honeymoon getaway from India, and with TMI you can also plan a dreamy one with utmost ease and comfort. A cultural buff at heart? We take you an enthralling cultural trip where you get relish from Balinese dance to the traditions of the Asmat people of Papua. Indonesia is a land of dramatic landscape, and thus, those who want to fall in love with nature, we have a special holiday package for them. Choose us to spend quality time exploring the Sulawesi coastline adorned with white-sand beaches and diving hubs; Sumatra and its 100 volcanoes; Bali’s surreal beaches and that of Nusa Tengarra; and Banda Islands. You surely do not want to miss Borobudur’s serene ambiance neither the bizarre funeral ceremonies of Tana Toraja, which we include in our travel guide to offer you a holistic Indonesia tour. 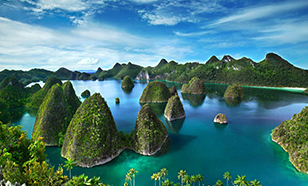 For adventurers and wildlife enthusiasts, we design tour packages, where they can enjoy the sighting of the famed Orang Utans or testing the waters of Indonesia while taking surfing breaks on remote islands. We also ensure the best places to stay, the quick flight bookings, and the best transport arrangements to make your Indonesia holiday as comfortable as possible. 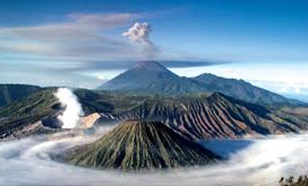 Reckoned to be one of the most active volcanoes in the world, Bromo Mountain comfortably sits inside the huge Tengger caldera and stands tall at an altitude of 2329 m above the sea. Hiking in Mount Bromo is the most prominent activity which gives travellers a chance to gaze upon the surreal vistas of sunrise, sand sea, and off-white sulphurous smoke which keeps coming out from the mountain. 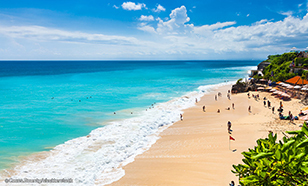 Touted as the perfect epitome of a relaxing vacation far away from the clamorous surrounding and milling crowd, Bali Beaches are packed with countless natural wonders that will proffer you an ultimate holiday experience here in Indonesia. Snorkelling, surfing, swimming, scuba diving, rafting, flyboarding, water jetpacks, and kitesurfing are some of the prominent water activities that tourists enjoy the most here. An age-old masterpiece influenced by Indian Gupta and Post-Gupta art that traces its history from 8th and 9th centuries is Borobudur – a Buddhist Temple comfortably seated in the downtown of Java Island. 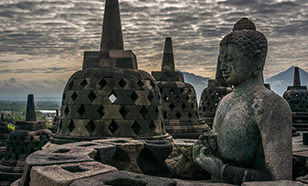 The compelling monument of Borobudur combines the symbolic forms of the mandala, the stupa, and the temple mountain. Amidst the meandering rivers, smoggy forest, and rugged countryside enjoy the ultimate forest exploration experience in the Indonesian part of Borneo Island, Kalimantan. Served as a perfect escape for all the nature devouts, Kalimantan is 73% of the total island and is a home to a various pulchritudinous island and enticing national parks. Holidaying on the island in Indonesia? Gili Island is your best bet. The weather and the calmness of this enchanting island is something that nobody really wishes to miss out. With its turquoise sea water along with the coconut palms and white sand, a tour to this beautiful place gives you an unforgettable holiday in Indonesia.